I learned about the 1984 movie Red Dawn while playing Call of Duty: Modern Warfare 2. The first chapter of the game’s second act starts with the player’s character riding a Humvee, crashing through American suburbs as Russian paratroopers drop from the sky: surprise, surprise, it’s a full-blown Russian invasion of American soil. The chapter is titled “Wolverines!”, which as I learned later is a reference to Red Dawn, the first portrayal of the Communist-invaders-in-suburban-America scenario. I haven’t watched the original movie, but just last year, a remake with the same title was released, this time with North Koreans as villains. Since I enjoyed playing as a soldier fighting through the middle-class neighborhoods of Virginia, I was naturally interested in seeing Red Dawn, and I grabbed the chance as soon as the movie was released in this country. The movie mostly disappoints, however. The exciting premise of Red Dawn is that of a war waged in where it’s most unfamiliar: right in the streets of the world’s military superpower. We’re used to images of war in dusty Middle-Eastern towns, soggy Vietnamese rainforests, or, further back, burning European cities and tropical Pacific islands. But war in warm American homes with pretty gardens and SUVs in the garage? That’s something new. 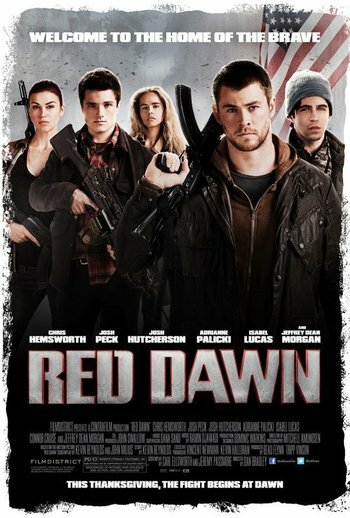 That’s a good enough what-if for a great movie, but the Red Dawn remake fails to become one. The original movie centers on a band of high school students who decides to resist the invasion and fights guerilla-style. They call themselves the Wolverines, after their high school’s mascot. The remake takes this story as well, complete with its 1980s-silliness. If the movie had the slightest sense of realism in it, it would’ve been a documentary of how a bunch of teenage fools got themselves killed by trying to become war heroes. With realism out of the question, the only option left for the movie was to become superb entertainment, but even in that aspect I found it lacking. Not only are the movie’s action scenes too implausible, but they’re also poorly edited. The pacing killed the thrill of the fights. Cookie-cutter dialogues and scenes filled the movie. Even by cliché standards, the delivery and impact of the scenes felt uninterested. Red Dawn is decidedly geared towards as wide an audience as possible: I could sense the movie avoiding blood and gore as much as possible. Also, the invaders in the story were initially Chinese; this was changed in post-production to North Koreans, so that the movie can be released in China. Having known this before seeing the film, I can’t help but think about how the change might have affected the storytelling. Aside from the fact that a character’s face is out of view every time that character pronounces “North Korea”, they might have had to edit out a significant number of shots that visually reinforce the enemy’s identity. The result is a military invasion movie wherein the invading army’s presence is hardly ominous. Red Dawn tries to lure its audience by focusing on valiant teenagers, but the ploy breaks down in the face of such vague, flat, and thoroughly unterrifying antagonists. The Red Dawn remake could’ve taken a different path, one that would have led it to a more memorable place in movie history. That path certainly does not involve the restraints that the producers kept to ensure a commercially viable product; that path would have needed the courage to ask important questions, about such things as the morality of killing, the idea of a just war, and the place of patriotism in a globalized modern world. That path would’ve also required the filmmakers to realize that there’s not much room anymore for Cold War sensibilities in movies, in a time when the greatest fear of America is its own slow decline, not devastation from a foreign power. Just to be fair, the film does have redeeming qualities. There are brilliant little gems scattered across the general meandering. Particular scenes that left an impression on me include that peace-sign gesture exchange, the gutsy twist towards the end, and one character’s reaction during the Wolverines’ first skirmish; those were some of the film’s more effective moments. The movie also ends with a rather beautiful shot. (Which, unfortunately, was also the only scene where the movie’s inconsistent cinematography worked.) These saving graces are not enough, however, to tip the critics’ scale to a favorable reception. Halfway through Red Dawn, a character mentions that he misses playing Call of Duty: Modern Warfare. Another responds, “We’re living Call of Duty!” The reference was so awkward that I suddenly remembered immensely enjoying the game. It’s difficult to take a movie seriously and consider it a good one if it’s not sure about its own seriousness. Reviews of it deserve titles with a pun.